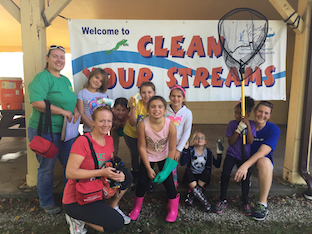 Registration for the 22nd Annual Clean Your Streams is officially open! Please click here if you are interested in participating in this event. We welcome individuals, business groups, organizations, students, and anyone else to come be a part of our biggest clean up! There are 7 kick off sites to choose from this year. Remember, if you are registering for a group of 10+, you must select a site captain for your group. We need help to keep this event running safely and smoothly. If you are unable to make it this year, please consider donating so we can keep this program going for years to come! Registration will be open until September 14th, so sign up now! Thank you for your interest in volunteering to help Partners for Clean Streams make our waterways clean, clear and safe for everyone. Our staff will let you know about upcoming events and opportunities for you to get involved! Thank You For Joining the Glass City Marathon Green Team! Your registration is complete. You will be receiving an email from a PCS staff member soon with further instructions. We have received your registration! You will be receiving a confirmation email within a few business days. Thank you to all who volunteered for Clean Your Streams 21! Check our online photo album for pics from the day: http://maumeeaoc.jalbum.net/CYS%2021-1/. We hope everyone had a positive, impactful day. Thank you for your hard work! !